If you search the web for hugelkultur beds, you’ll find lots of different approaches. If you compare two images, they often look so different it’s hard to believe you’re looking at two pictures of the same thing. Everyone seems to have their own way of building hugelkultur beds. But how do you know which hugelkultur variation is right for you? Keep reading to get the information you need to pick the right variation for your garden or homestead. Hugelkultur beds are a fantastic way to grow food using little to no irrigation by working with nature. Plus, these beds are really fairly straightforward—they’re just soil and buried wood, after all. Well… it turns out there are a lot of different ideas on what constitutes a hugelkultur bed or how to build it, and people can be very opinionated about which is the “right” way to do it. This post takes all the different hugelkultur variations and breaks them into 5 general types, so that you can find the type that fits your needs. For each hugelkultur variation, we’ll go over a brief description of the variation and its pros and cons. All hugelkultur beds bring a number of advantages to your garden, creating rich soil, reducing watering needs, and providing habitat for beneficial fungi. In general, I won’t repeat these advantages in each of the pros and cons sections unless the specific hugelkultur variation is superior (or lacking) in that one area. This post is about how the different hugelkultur variations compare with each other, not how they compare with other types of garden beds. As you read through the descriptions and pros and cons of each hugelkultur variation, take a moment to think about your own situation and which type will work best for you. To help you with this, we’ve created an easy-to-print cheat-sheet that highlights some key takeaways and offers a list of questions to help you figure out which hugelkultur variation is right for you. Sign up to get your cheat-sheet so you can get started with the best hugelkultur bed for your wild homestead. You may find examples of this hugelkultur variation on a lot of websites and in YouTube videos. People hear that hugelkultur beds are just buried wood, so they make a slash (or brush) pile and add soil on top and call it good. This variation also gets a lot of use when people end up with a lot of woody debris and are looking for a way to use it up. Often this is from pruning trees and shrubs, which can produce quite a bit of branch-size woody debris. Compared with just burning the slash, this hugelkultur variation is a great option. But it does have some draw backs that unfortunately has led to people feeling that hugelkultur beds don’t live up to the hype. In the long run, this method can work great, and it’s by far the easiest to build out of the 5 hugelkultur variations. But in the short run, this variation is prone to drying out and having issues with rodents. Of all the 5 variations, it’s also the most prone to settling. In other words, if you plant into it right away, you might find that parts of your garden start to cave in a bit. After the bed settles and the slash has mostly broken down, you’ll be left with a nice mound of rich soil. You can either plant into the mound directly or harvest the soil to use elsewhere. It can seriously take about 10 years for the slash to turn to soil with this method. This may seem like the quick-and-easy method, but it’s not for the gardener in a hurry. That said, you don’t need to wait for the soil to break down fully to start planting in it—especially if you add leaves, or old bedding from your chicken coop, or other organic material on top of the hugelkultur bed each year. This will help build soil on top, as it would in any garden. This image shows the construction and results 2 years later for one of my partially buried hugelkultur beds. I chose this type because the ground was so compacted that I wanted to break through the top layer to help the plant roots out. This hugelkultur variation is very similar to the next 2 on the list, except instead of building the hugelkultur bed fully above ground, this bed is either fully or partially buried below the existing ground level. As with most hugelkultur beds, the general way to build this variation is to place the largest woody debris (logs) on the bottom, then add soil, and then add smaller woody debris (small logs or big branches), then add more soil, and then repeat the cycle through to the smallest woody debris you have. The difference is that with this variation, you first need to dig a trench that’s the same length and width as your hugelkultur bed. Then you add the logs to the trench, and then the soil, going through the above cycle of wood, soil and more wood. This will result in a hugelkultur bed that is slightly mounded above the surrounding ground level, but it’s mostly buried below ground level. If you want, you can continue to add more wood and more soil to build the bed up above ground level. The big advantage to this hugelkultur variation is that you can reuse the soil you dug out, so you don’t need to bring in extra soil unless you want to continue to build the bed up. Since the logs that will hold the water are mostly below ground level, this bed is less likely to dry out. That makes this hugelkultur variation a good option in hot and dry climates. But by burying the hugelkultur bed, you lose the advantage of micro-climates that large hugelkultur beds have when built above ground. This includes blocking and breaking up the flow of wind across your property, which can extend your growing season and reduce evaporation in other parts of your property. This is my front planting area early on when I was just getting it setup. The areas mulched with straw are a series of small hugelkultur beds. I wanted this area to stay open so I was limited to small beds. These beds provide a limited benefit. This hugelkultur variation is built the same way as the previous variation, but instead of digging a trench, you just place the wood on the ground and add soil on top of it. Start with large pieces of wood, and then follow the wood --> soil --> wood --> soil rotation, using smaller and smaller pieces of wood as you move through the cycle. With this variation, you’ll stop building the hugelkultur bed when it’s 3 feet high at most. If you keep your bed fairly small (about a foot high), you may only have one layer of wood and one layer of soil. By keeping the bed smaller, you don’t need as much wood or soil as you would with a larger bed, but you lose some of the advantages that a larger hugelkultur variation can confer. Since these beds are small, they won’t be able to hold as much water as a larger above-ground or buried hugelkultur bed. But you will still build rich soil over time, and you’ll create a good environment for beneficial fungi, which will help your plants. These beds will create some micro-climates, but not to the same extent as larger above-ground hugelkultur beds. But this hugelkultur variation will look more like a regular garden bed, making it more acceptable to neighbors and family. This is my tallest hugelkultur bed about 3 months after being built. While not small (~4 ft tall) this bed is much smaller than the largest hugelkultur beds that can be 7+ feet tall. But this bed still provides a lot of benefits and is doing great. These beds are built the same way as the smaller beds, but they are much larger. This hugelkultur variation can be 4-7 feet tall, or even taller! This means that these beds will be also need to be wider than the smaller beds. Since these beds are so large, they create more extreme micro-climates than smaller hugelkultur variations, and they’ll break up the flow of wind across your land. The top of these beds will be drier, while the bottom will be wetter. In addition, depending on orientation, these beds will likely have some parts that get a lot of sun and other parts that are shady. If you make these beds curved instead of straight, you get even more micro-climates. By creating all these micro-climates, these large hugelkultur beds can support a wider range of plants than the other hugelkultur variations. Harvesting these beds can be tricky. The lower parts will be easy to harvest, but the top can be hard. Some people have even built wooden scaffolding on the outside and added paths midway up to make it easier to harvest the upper levels of large hugelkultur beds. But these beds will require much more soil and wood to create. (You’ll need large logs.) Given their size, you may also need to use a tractor or excavator to build. One option to minimize the amount of soil you need to bring in is to dig down around the beds and pile that soil up on top of the wood. This works well, but it will create low areas around your beds which may trap water and end up staying muddy, depending on how well-drained your soil is. Filling in these low areas with small branches and wood chips or chop-and-drop material can solve this issue. The final issue is that this hugelkultur variation may not be acceptable in appearance to neighbors and family, and because of their large size, they probably are not appropriate for small urban lots. This is my new kitchen garden (in-progress). What you can't see is that these beds go down ~3 ft and are filled with multiple layers of logs and other woody debris plus soil. Hugelkultur beds can blend in and look "normal". This final hugelkultur variation is where you make the beds look like formal raised garden beds. This can be done by just building a regular raised bed with wooden sides and then adding logs to it as you fill it up with soil. You can also dig a trench and fill that in, like in the 2nd hugelkultur variation, and then just add your raised beds on top. The advantage is that these beds can look more formal and easily pass as regular garden beds. But you lose the growing areas from the sides of the beds and the micro-climates found on those areas. Harvesting from these beds is no different than harvesting from a regular raised garden bed. These beds are likely to be smaller than the larger hugelkultur beds, but you can dig down in addition to building up, which provides more water holding capacity. Our new kitchen garden was built this way to maximize its water-holding capacity. In addition, since these beds will be smaller, they are less likely to block or break up wind moving across your land. This hugelkultur variation will also have the added costs of the material needed to build the retaining walls of the raised beds (unless you can salvage the material and get them for free). Out of the 5 hugelkultur variations covered in this post I have built 4 of them on my homestead. Each time I picked the variation I did because it was the right one for that situation. Which hugelkultur variation is right for your site? At face value, these beds seem straightforward. But as you can see, there are a few hugelkultur variations, each with their own set of pros and cons. Understanding these pros and cons will let you choose which hugelkultur variation is right for your specific situation. On my own homestead, I’ve built 4 of these 5 hugelkultur variations, totaling around 300 feet of hugelkultur beds. The only one I haven’t built is the slash pile variation, since I’ve wanted to be able to plant sooner rather than later. In each case I looked at the situation and determined which variation was right for that spot. As you are thinking about your own situation, look through the pros and cons and pick out the hugelkultur variation that’s right for you. 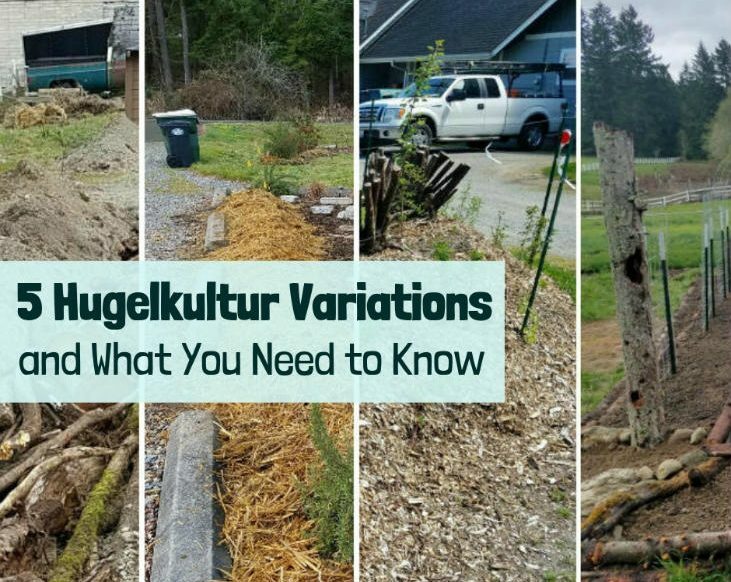 To help you do this we’ve created an easy-to-print cheat-sheet that highlights some key takeaways and offers questions to help you figure out which hugelkultur variation makes the most sense for your situation. Sign up to get your cheat-sheet so you can get started finding and building the right hugelkultur bed for you. This is a great post, that really helps to get the point across the hugelkultur is more of a principle than a very specific design. My first use of hugelkultur was my herb spiral, which I filled with woody debris prior to filling with soil. My next plan is to build some extensive, partially buried beds. I’ve got a ton (literally!) of logs and branches (mostly pine), that I’m planning on using. My task now is figuring out orientation and size of the bed(s). Hello Mike and thank you for your comment! I have yet to build a herb spiral but it is on my list to do at some point and I like the idea of making it a hugel bed. Sounds like you have an awesome hugel bed project in the works–thanks for sharing and good luck! I thought #4 was the “real” hugelkutur bed. I dug a #5 as a compromise for neighborhood aesthetics but kind of felt I was cheating. Thanks for the validation! Yeah… Some people will feel that #4 is the only real hugelkultur bed but I think that limits the use of this technique to a relatively small number of people. I would rather expand the definition to help more people use hugelkultur beds since all these variations provide benefits. Thanks for sharing! What I like the most about your descriptions is that they are simple and to the point for a beginner like me. I have been interested in making a Hugel mound for a few years now but this year after reading your blog has inspired me to make this year the time to get going! Thank you! I’m very glad that the post has been helpful for you Gerry. I wish you luck with your hugel mound! Thank you for your comment!